How do you decide where to eat when you’re on vacation in a new locale? Deep research via the interwebs? Friends’ recommendations? Advice from the concierge or innkeeper at your place of lodging? For many of us, what and where we eat while traveling becomes part of the story. We experience a sense of place through local food. Food stories influence our experiences and shape our memories. Fortunately, a quick Google search for “food tours” led me to Central Coast Food tours, which offers — yasssss! — a Downtown San Luis Obispo Tour that they call “a food tasting, cultural and historical walking tour all in one!” You had me at hello. Central Coast Food Tours is owned and operated by husband-and-wife team, Laura and Yule Gurreau. The Gurreaus are long-time Central Coast residents and passionate supporters of the area’s evolving food and wine scene. In addition to the San Luis Obispo walking tour, they also offer several walking tours in the town of Paso Robles — which has seen amazing growth in its local dining scene in recent years. You can experience “Paso” through a daytime downtown tour (similar to the SLO walking tour), a Sunday brunch and wine walk, and an evening “haunted hotel” dinner tour. 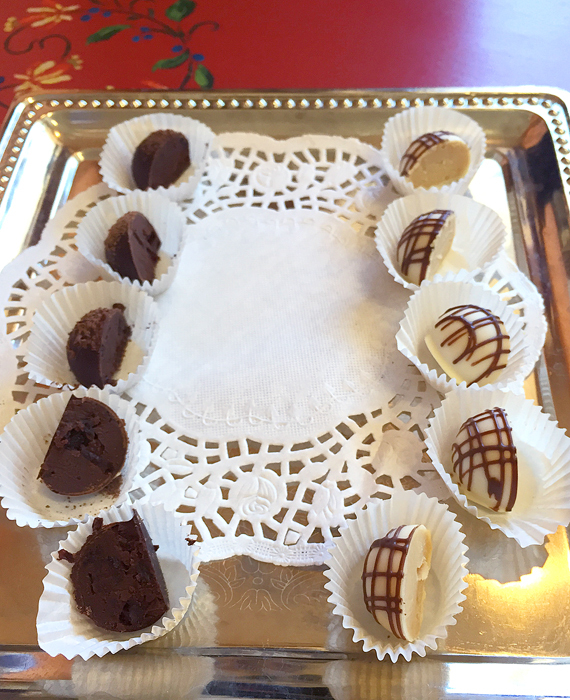 Our meeting place and first tour stop was Mama Ganache Artisan Chocolates (1491 Monterey Street), a leisurely 15-minute walk from my bed and breakfast. I was the first to arrive and chatted with Yule, who would be leading the tour, while we waited for the rest of the group to arrive. (Laura was leading her own tour in Paso Robles that afternoon.) In all there were six of us: myself, Yule, a couple from Paso Robles, and a couple from Los Angeles. Keeping the group size small gives the tour a relaxed feel and makes it easier to get to know everyone. Mama Ganache is a small, cute shop that produces a variety of handmade chocolate treats with an emphasis on truffles, bars, and molded chocolates. 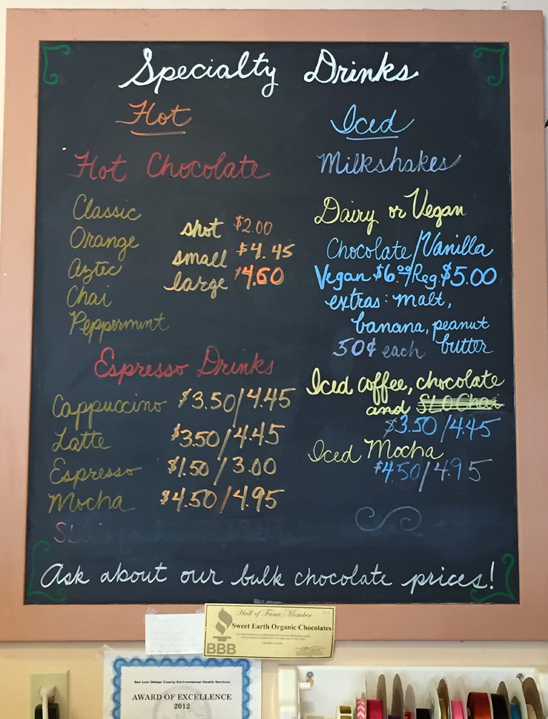 In addition to a variety of chocolate confections, including vegan and gluten-free options, they also offer an assortment of hot chocolates, coffee drinks, and milkshakes. After our group had assembled, we settled into the comfy couches at the front of the shop. 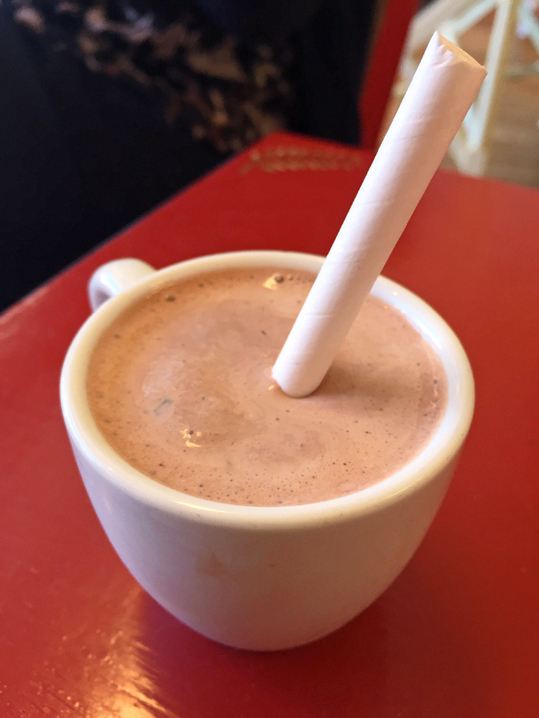 While we enjoyed our first taste — a refreshing, creamy, peppermint-accented, milk-chocolate milkshake served in an espresso cup — Yule gave us a lesson in chocolate processing, as well as the back story on Mama Ganache. Created and owned by Cal Poly professor of Food Science and Nutrition, Tom Neuhaus, and his sister Joanne, Mama Ganache is a values-based business. They specialize in using fair-trade, organic chocolate and emphasize chocolate education and sustainable cocao farming. After the milkshake palate cleanser, we were ready to taste two of the shop’s unique truffles. The first was a white-chocolate zabaglione-inspired truffle that had just enough marsala to keep it interesting without being too boozy. The second taste was a dark chocolate cherry-chipotle truffle. After the tasting, there was time to chat with the store employees about products, check out the various chocolate-themed gifts for sale, and of course, purchase an assortment of truffles. Leaving Mama Ganache, we headed west on Monterey Street, toward downtown, stopping in at Jaffa Café (1308 Monterey Street). Serving casual, classic Mediterranean-style cuisine to eat in or take out, Jaffa Café has four locations throughout San Luis Obispo county. The SLO location, however, was the first, and continues to be very popular with locals. Jaffa Café has been a local readers’ poll winner for “Best of SLO County – Best Mediterranean Food” seven years running. Menu choices for meat eaters include kabob plates, shwarma plates, pita wraps, and fatoush salads. Vegetarians and vegans are not left out by any means. 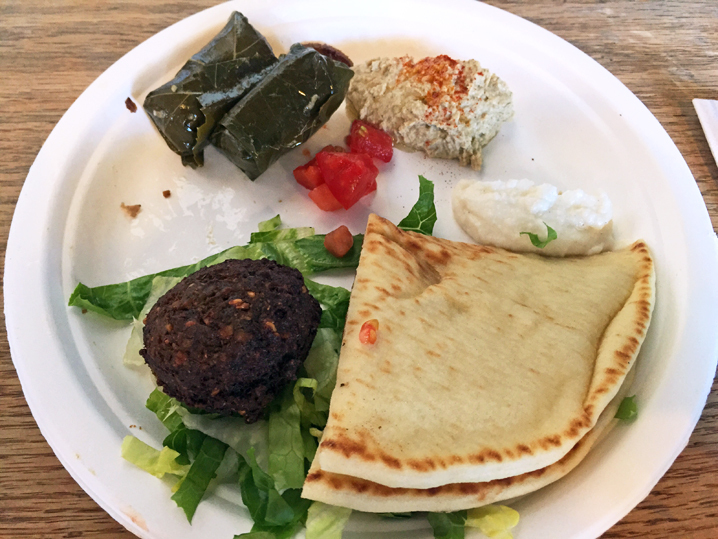 Non-meat options range from pita wraps and salads to a “make your own combo” plate with choices that include stuffed grape leaves, hummus, baba ganoush, and grilled veggie salad. By the way, now would be a good time to mention that the tour is vegetarian/vegan-friendly, so make sure you share any dietary restrictions when you book. Yule had noted that I’d requested non-meat dishes when I signed up, and he made sure that my sampler plate came with falafel, instead of gyro meat. Our walk from Jaffa Café to gourmet food and olive oil purveyor We Olive (958 Higuera Street) took us back into the heart of downtown San Luis Obispo. Along the way, Yule shared his knowledge of local history while pointing out historical buildings. 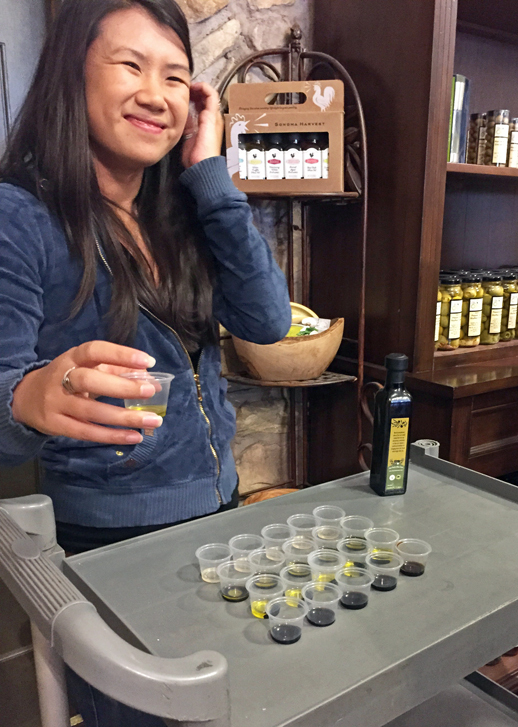 At We Olive, we sampled just a few of the shop’s more than 40 varieties of olive oils and vinegars. My favorite was the organic Meyer lemon olive oil, which turned out to be the perfect summer salad dressing. Some of the more popular oils and vinegars are sold by the ounce, allowing customers to buy just what they need. You can bring your own bottle to fill or purchase one of We Olive’s reusable glass bottles. Return a bottle for a refill and save $5 – 7.50, depending on the bottle size. 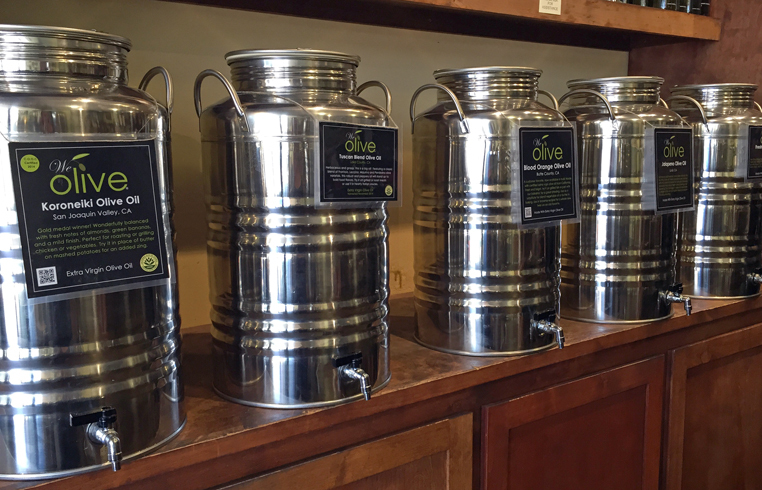 We Olive takes a local/regional approach to olive oil tasting and sales, with locations throughout the Central Coast and Bay Area. (Note that We Olive is a franchise-based business, so not all stores will be the same.) Olive oils sold at We Olive in SLO are California-grown and Certified Extra Virgin by the California Olive Oil Council. According to We Olive’s website: “[m]any of our oils are grown and pressed right here in the Central Coast, providing nutrient-rich products that support local producers.” You can also purchase olives, mustards, and other savory condiments. 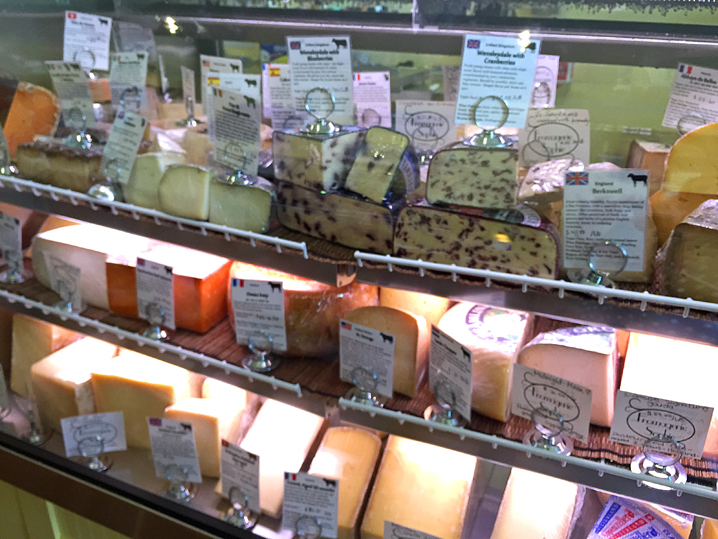 Our next tour stop took us to Fromagerie Sophie, a French-inspired cheese shop on Garden Street, just a couple of blocks west of We Olive. The famous Bubblegum Alley is just around the corner, and Yule offered to take us through before heading into Fromage Sophie for cheese tasting, but everyone in our group had already seen it, so we passed — which left more time for cheese! Fromage Sophie stocks and sells a large assortment of cheeses from around the world (with an emphasis on French cheeses, of course), including some unique and small-batch cheeses that Sophie orders directly from the makers. In addition to sales, the shop also offers classes and participates in local food and wine events. Our group was led through the small shop, past the refrigerated glass cases stocked with cheeses, and out the back door to a private patio area accented with string lights and olive trees. An umbrella-shaded table was set and waiting for us; perfect for a mid-afternoon respite and cheese tasting. It’s the kind of spot, where you might, after a glass or two of wine, forget that you’re in Central California, and imagine yourself in the Rhone valley or a Tuscan hill town. After we had settled in, shop assistants brought beautifully arranged platters of cheese samples, dried fruit, honey, bread, and charcuterie. (Remember what I said about not eating too much before the tour?) As we tasted, we compared notes on the different cheeses — which we preferred, which tasted better with a slice of dried apricot or pear versus a drizzle of honey (or both), and whether wine or scotch whiskey is a better pairing for rich, creamy cheeses. 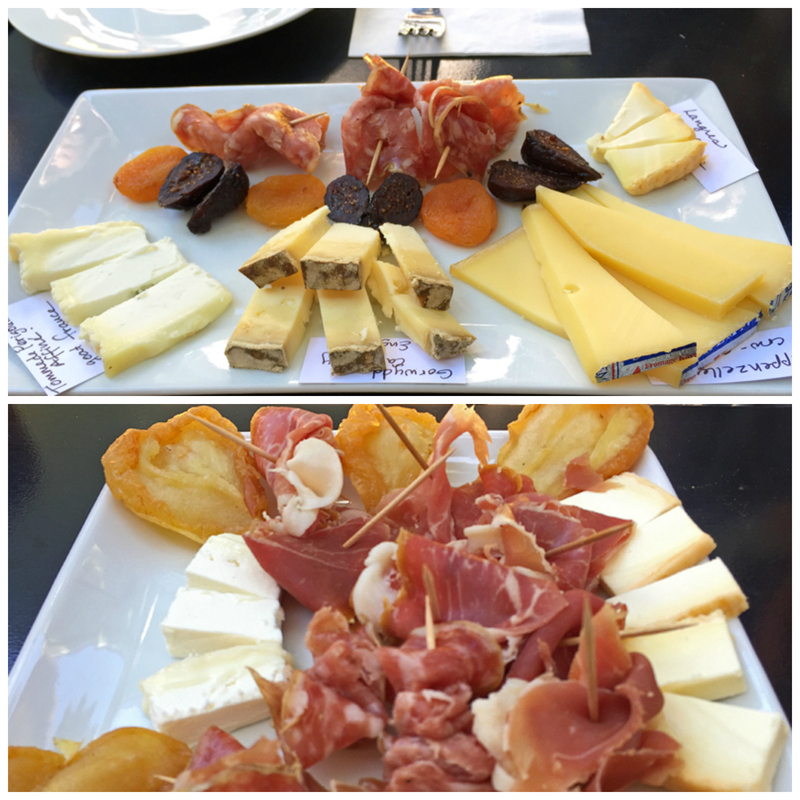 While Fromagerie Sophie would have been a lovely ending to our afternoon tour, there were a few more stops to make. 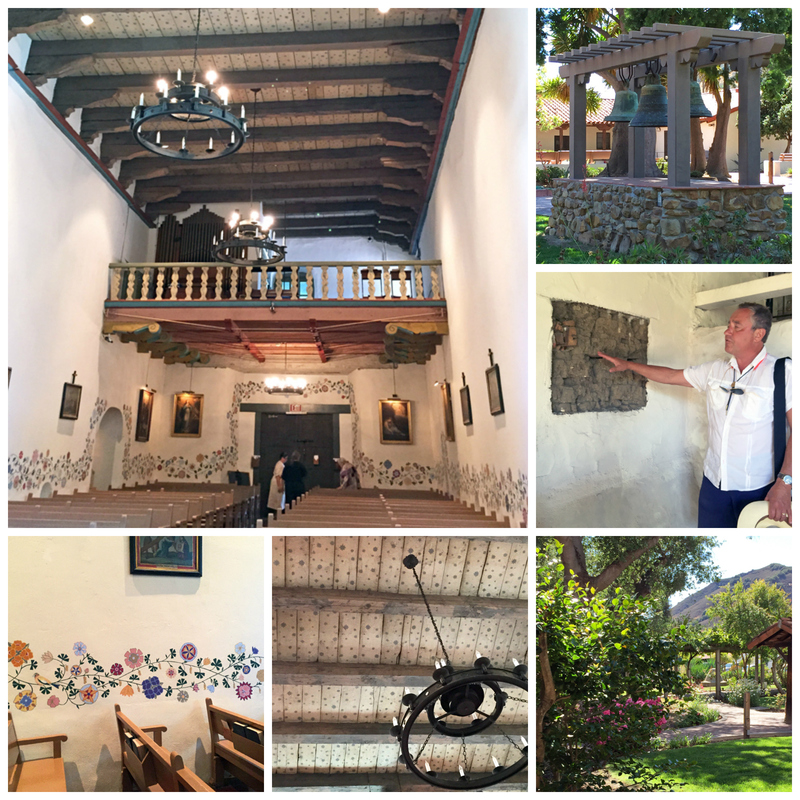 We had an opportunity to walk off our cheese tasting and learn a bit of California history with a visit to the heart of downtown’s historic district: Mission San Luis Obispo de Tolosa. The fifth of 21 missions founded by Franciscan fathers along California’s mission trail from San Diego to Sonoma, San Luis Obispo de Tolosa remains among the top five to visit. The buildings have been updated and restored and include a museum and gift shop. The mission church is open to the public when not holding Catholic services. Make sure you check out the beautiful hand-painted walls and ceiling inside the church and then take a stroll through the gardens. The plaza next to the mission is home to a variety of local cultural events, including a summer concert series and a Dia de los Muertos celebration. Backtracking a bit, we crossed the Mission Plaza and headed two blocks up Monterey Street for a taste of Italy at Palazzo Guiseppe. The restaurant sits at the Monterey end of Court Street, a block-long pedestrian mall of shops and restaurants that connects to Higuera on the other end. The restaurant’s casual outdoor seating puts you right along the pedestrian mall and lets you enjoy the warm San Luis Obispo summer evenings while watching the world go by. The interior of the restaurant is upscale and contemporary without being stuffy. With a menu that focuses on southern Italian-influenced cuisine, Guiseppe’s is committed to using local, seasonal ingredients. In fact, this family-run restaurant — one of two opened by founder Giuseppe “Joe” DiFronzo (the other is in Pismo Beach) — sources produce from the family’s own organic farm. Our group was seated at a pre-set table at the front of the interior of the restaurant and served one of their most popular dishes: an appetizer-sized version of their housemade Ravioli di Zucca. 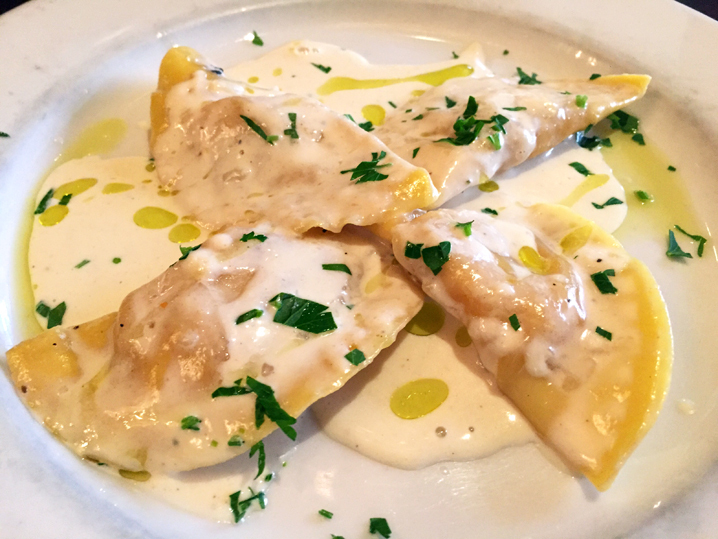 Guiseppe’s makes their own dough for this rich dish of demilune-shaped pasta filled with butternut squash purée and sage, complemented with a parmigiana cream sauce and finished with a drizzle of olive oil. Tasty, but perhaps a bit heavy for a fifth tasting (especially after the cheese and charcuterie tasting earlier). The hospitality at Guiseppe’s was gracious and attentive. When one of our group requested a substitution, it was handled quickly and in a friendly manner. I think we were all starting to wind down at this point, but there was one last stop to make. We thanked our hostess at Guiseppe’s and headed down the street to our final destination: Luna Red. If you read Part Un of my SLO food trip, you’ll recall that I’d dined at Luna Red the previous evening. Not to worry, though, as there were plenty of dishes on the menu that I didn’t get to taste (including dessert). 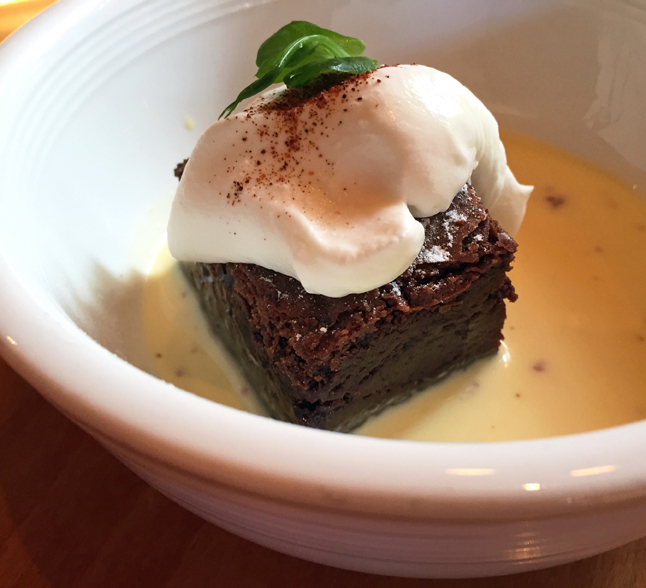 Our SLO food tour came to a sweet end with Luna Red’s rich, brownie-like chocolate cake with crème anglais and a glass of wine. Yule left us as we finished dessert, but with no schedule to keep, the rest of us stayed on for another glass of wine and more conversation. It turns out that one of our group, Miranda, is the owner of the local Powell’s Sweet Shoppe on Court Street, right next to Palazzo Guiseppe. She offered to show us the shop and let us sample their gelato! (Post-dessert, anyone?) It was fun to see the business that she’d so passionately spoken about during our tour. Powell’s was nothing short of a candy lover’s dream. 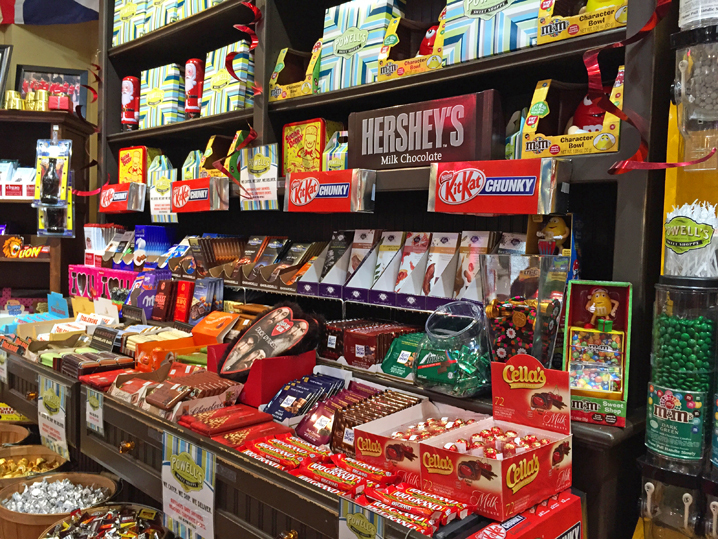 Every confection you could imagine is stocked in the store — in addition to the delicious, creamy gelato. As much as I enjoyed tasting SLO, meeting a fun group of food lovers and getting to know them made the tour a richer experience. I took the long way home to my bed and breakfast, exploring the downtown streets and the nearby residential area. The night was warm, the downtown crowd lively, and there was no need to hurry back. When I returned to my bed and breakfast later that evening, I found that Yule had left a little thank you gift of truffles from Mama Ganache and baklava from Jaffa Café. It was a sweet ending to an enjoyable and educational day in SLO. I’d tasted my way through some of SLO’s best-loved food spots and met a nice group of people. Walking food tours are a fun way to get an overview of the local food scene. Not only can you meet and connect with other like-minded travelers, but your guide can provide access and insight to the local food scene that you might not discover on your own. Have you taken a food tour? Share your experience in the comments below. You are currently browsing entries tagged with vegetarian food in San Luis Obispo at 650Food.